It’s been said to be successful in chess, or wine for that matter, you must constantly be thinking several steps ahead in tactics and decision making. From deciding where a pawn can be sacrificed to gain better position, to pitching single vineyard merlots and/or chardonnays at super premium prices, you must think your way through from start to finish. There’s no rushing in chess or wine; the best moves are all well thought out. Mission Hill Winery owner Anthony von Mandl appears to be doing just that at one of his latest ventures in the south Okanagan, CheckMate Artisanal Winery. Checkmate’s first move was unconventional, as they launched their first vintage online only. There is a physical building, the old Domaine Combret Winery, that had morphed into Antelope Ridge over the years, but it won’t be open to visitors very often. The facility has had a light retrofit but it is merely a place to make and raise the wine. There is no wine shop, visitor centre or restaurant. To add to CheckMate’s mystique, there are only two grapes in focus: chardonnay and merlot. Where they come from is the real story. CheckMate sits on the Golden Mile Bench, the newest and only recognised sub-geographical indication, or sub-GI, inside the Okanagan Valley. While this home site contributes to the labels, the winery produces several single site wines from around the south Okanagan. There are ten labels now, four merlot and six chardonnay, each boasting a different site selection or blend of sites. By keeping the winemaking the same throughout, the aim is to express the individual site. Hardly revolutionary in the greater wine world, but this marks another step in the evolution of the Okanagan Valley where origin and site has played a secondary role to grape and producer. The man behind the wine is Phil McGahan. A transplanted Australian, McGahan grew up on a grain farm in the Darling Downs region of Queensland before obtaining a degree in law. After a short stint in the legal profession he caught the wine bug and returned to Charles Stuart University where he earned a Bachelor of Applied Science (Wine Science) degree and was Dux of his graduating class. From school, he ended up in the Hunter Valley but soon landed an important post as assistant winemaker at Sonoma-based Williams Selyem Winery, famous for its pinot noir and chardonnay, most of which sells for the equivalent of $80 to $125 a bottle. After several years in Sonoma, McGahan couldn’t resist the opportunity to come to British Columbia and run his own show at CheckMate. There is nothing brash about McGahan; his quiet, studious demeanour feels perfectly suited to the demanding, frenetic pace Von Mandl works at. They seem a perfect match. Speaking of perfect, you can expect the CheckMate wines will spawn a great many minutiae, from clones to rootstocks, to barrel makers, fermentation techniques and blending and ageing strategies. I’m not going to sugarcoat it for the keep-wine-simple crowd. This is a complex chardonnay project and it’s pushing a lot of boundaries. Shoot thinning and positioning is key at CheckMate and it is something the team has brought over from viticulturist James Hopper’s work with pinot at Mission Hill Family Estates and Martin’s Lane. Once the thinning is done, and done early, the shoots can be further positioned. It’s a new architecture that spreads out the fruiting zone, produces uniform, open bunches that results in higher quality fruit. It’s safe to say, everyone involved is inspired by the great chardonnays of Burgundy, and there is a resemblance, but at the end of the day, CheckMate’s style is neither Old World nor New World but rather Next World, Okanagan Valley. If you have yet to encounter any of the distinctive, stout, antique-looking bottles you are going to have to change your thinking. To interact with CheckMate, you must do it as a club member, or in a restaurant. As they say, membership has its advantages, and in this case, it gives you access to a limited number of bottles only sold online. Post fermentation, after a 50-plus day maceration, the wine is drained by gravity from the fermenter direct to barrel. Eventually, it is bottled unfined and unfiltered after 21 months. It’s an impressive first release, achieving the important goal of recognizing that Okanagan merlot is highly underrated. It’s hard to pick a favourite at this stage because they will all improve over the next year. My early leads are the Opening Gambit Merlot 2013 from grapes off the Osoyoos East Bench – a more savoury, Bolgheri style, and End Game Merlot 2013 that comes off Osoyoos East Bench and Black Sage Bench. The latter is lovely, an elegant style with bright, savoury, warm fruit and just a hint of spice. A classy start toward a new-style of Okanagan merlot where less is more. All the merlots list at $85. The 2014 chardonnays to be released this week are even more exciting. Less new oak in the mix (as the barrel cellar ages) and the continuing effects of precision fruit positioning to get maximum exposure is having a big impact on the overall quality of the raw fruit. There is also more natural ferment happening at the winery which adds more complexity early, before the pure chardonnay fruit establishes itself with age. Maybe the biggest change, albeit a subtle one, is a take away from a 2014 trip to Burgundy. McGahan took the wine out of the barrel about a month before bottle and left it in stainless steel to tighten up the wines, or add some tension, as they say in Burgundy. It proved to be a key difference for these wines in a warm year such as 2014 - imperative to balance the acidity with the ripeness. The Border Vista site is a single block, planted in 1997 to Dijon clonal material planted a mere 30 feet from the BC-Washington border along the east side of Osoyoos Lake. The soil here is fine-textured sands deposited by glacial melt water at the end of the last Ice Age, some 10,000 years ago. Dekleva sits southwest of the town of Oliver and is now just over 40-years-old. The vineyard boasts an extraordinarily distinctive Chardonnay clone, of unknown origin, that winemaker Phil McGahan says they are calling the Dekleva selection. The soils are a mix of predominantly coarse gravels known as Stemwinder, Ponderosa and Ratnip soils. 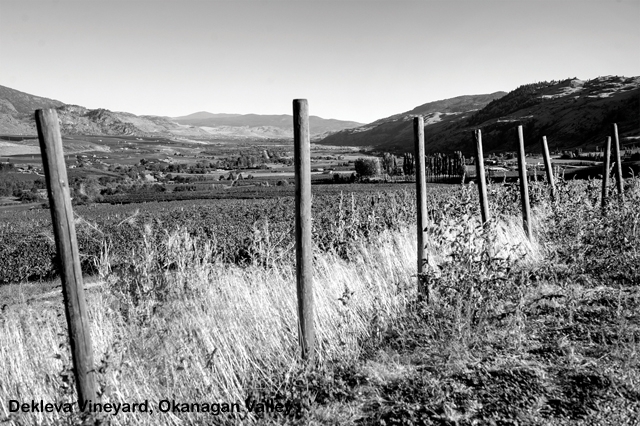 Nestled in the Okanagan Highlands foothills of the Black Sage Bench, just southeast of the town of Oliver, these blocks were planted in 1999 on a west-facing plateau. The porous nature of this soil produces low-yielding, small grape clusters concentrated in flavour. Sunset is situated to the south of the Barn Vineyard and was planted to 23 three-year old vines from clones 76 and 95. The vineyard’s unique row orientation combines with variations in elevation between the two micro-blocks and the porous soils of the Black Sage Bench to create distinctive fruit. The site, up above Black Hills, is planted to two blocks and two clones: Clone 76 for structured elements and Clone 95 for richness. The Combret Vineyard has yet to spawn a single site wine but CheckMate’s estate vineyard, neighboring the Dekleva Vineyard, is perhaps the oldest chardonnay planting in Canada rightfully tagged Golden Mile Bench. The gnarly vines, of unknown clonal origin, are deeply rooted in the Golden Mile Bench soils and utilize them to full potential. McGahan says he will likely release a 2015 Combret Vineyard wine but for now we must wait. The chess theme runs through the lineup so we thought we would bust out a few reviews before all the pieces were taken and someone shouts checkmate! Here’s a look at the latest CheckMate releases: the 2014 chardonnays (year tw0) and the 2013 merlot (year one).